John Wesley a Crawley and Horsham Hunt supporter pleaded guilty to driving without due care and attention, having no insurance and failing to report an accident. On what should have been the first day of the trial, John Wesley pleaded guilty. Horsham magistrates, Sussex gave Wesley 9 points on his licence but he received less than £500 in fines, costs and compensation, and was only ordered to pay £80 of more than £2,000 damage he caused, after he rammed a hunt monitor’s minibus off the road. The incident had occurred during the first meet of the Crawley and Horsham hunt after the introduction of the Hunting Act in February 2005. Wesley is already banned from driving having been convicted for having no insurance on a more recent occasion. Wesley had been driving an unregistered Range Rover which could not be traced. However he was identified some weeks later from video taken earlier in the day. Anti hunt campaigners believe he should have faced more serious charges as this was a deliberate act of menace. As it is, his fine and costs are less than the £600 third party insurance that the hunt monitor’s minibus had! While awaiting trial, Wesley continued to attend the hunt, on one occasion bashing his fist on the window as the minibus passed and acting in an intimidating manner. However, more recently he received bail conditions preventing him attending the Crawley and Horsham Hunt after he was charged with assaulting two female hunt monitors. That trial is set for July 2006. 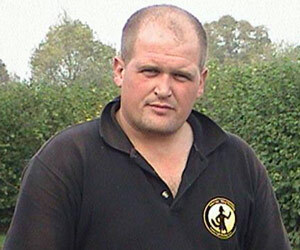 Having no insurance is a common practice for hunt supporters: In September 2000, hunt saboteur, Steve Christmas was deliberately driven over by a 4X4 vehicle at a meet of the Old Surrey and Burstow hunt in Sussex. He suffered a broken hip, required abdominal surgery to remove punctured small intestine and was on a life support machine for many days. The hunt supporter who did it had no insurance. There was no criminal case, but the Criminal Injuries Compensation Board awarded substantial compensation after accepting a serious crime was committed.